Unlike their cousins, the free-swimming, nonparasitic planaria, tapeworms are characterized by the complete absence of digestive tracts. The scolex at the anterior end of the cestode is a specialized body segment (or proglottid), which anchors the parasite to its host. Several different evolutionary strategies are adapted for this key anatomical feature in this class of flatworm. The scolex is usually covered with hooks or suckers and is used by helminth taxonomists as a key characteristic for identifying species of tapeworms. The pork tapeworm, Taenia solium has a scolex that features a double crown of 22 to 32 rostellar hooks and four simple, round suckers. The hooks fall into two size ranges (160 to 180 microns and 110 to 140 microns). As with other cestodes, the pork tapeworm fastens onto its host (primarily muscles for this species) and absorbs nutrients through its skin. This is the tapeworm that can infest humans if eaten in pork that has not been thoroughly cooked. The dog and cat tapeworm, T. pisiformis, also possesses four simple round suckers on its scolex that are lateral, plus a formidable array of hooks, for latching onto the intestinal tract of its host. With four suckers and no rostellum, the hookless beef tapeworm, T. saginata, takes a slightly different anatomical approach to grabbing onto its food sources, which are primarily cattle, but can also be humans who consume undercooked beef. Another hookless tapeworm featuring four suckers on its scolex, Hymenolepsis diminuta is primarily a rodent parasite that uses an arthropod intermediate host. 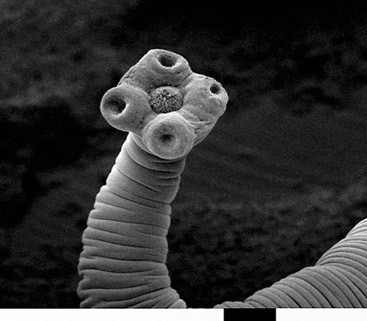 The related dwarf tapeworm, H. nana, is probably the most common human cestode in the world and its scolex features four suckers and a short rostellum of hooks. This species is the only human tapeworm that does not require an intermediate host and autoinfections through accidental egg-contaminated stool ingestion associated with poor hygiene is possible. Known commonly as creeping seeds, Dipylidium canium is an intestinal cestode found worldwide in domestic dogs and cats, which can also infest humans. As with other tapeworms, this hermaphrodite is able to fertilize its own eggs and it uses fleas as the intermediate host. The rostellum and hooklets of this parasitic flatworm are retractable and it features two pairs of round suckers. Catfish tapeworms (Corallobothrium fimbriatum) use copepods and small minnows as their intermediate hosts and later infect various catfish species, as the common name implies. The scolex features ovoid suckers for clinging to their fish hosts. Still another variation on scolex structure is exhibited by the tapeworms in the order Pseudophyllidea. Bothria or sucking grooves are used as the holdfast structures on the rostellum of the broadfish tapeworm (Dibothriocephalus latum) and other related species that infest all classes of vertebrates, but particularly favor predatory fishes.